When an airliner loses both engines at an extremely low altitude after a bird strike, pilot 'Sully' Sullenberger (Tom Hanks) performs an emergency landing on the Hudson River in New York. Dubbed the 'Miracle on the Hudson,' Sully is met with praise from the media and the general public, but behind the scenes, an investigation is launched to determine if he really did the right thing. 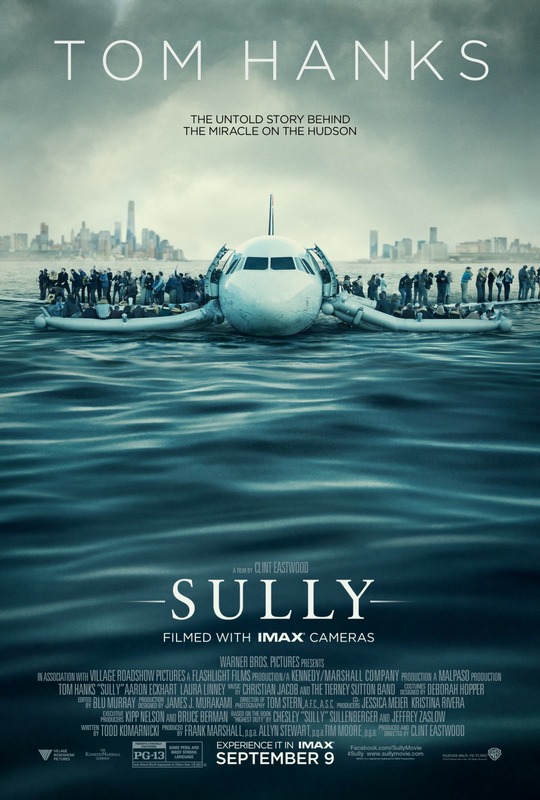 "Sully" is directed by Clint Eastwood and is based on the book "Highest Honor" by Chesley 'Sully' Sullenberger and Jeffrey Zaslow. It stars Tom Hanks as the titular pilot-dubbed-hero Chesley Sullenberger, and Aaron Eckhart as his co-pilot Jeff Skiles. It depicts the events surrounding 'The Miracle on the Hudson' including the crash itself, the media frenzy directly after the crash, and the investigation that followed. Most of the public sees Sully as a hero because he saved the lives of all 155 souls on board the disabled airplane he was piloting. How often does a pilot get to say he saved every single person on his plane? After quickly rising to hero status, Sully doesn't know how to cope with his new found fame as he is more nervous about the bright lights and cameras than he is telling his story. He knows he's in the right by doing what he did. Apparently, not everyone feels the same way. The primary focus of the film is on the investigation fronted by Charles Porter, played by Mike O'Malley, who seems like the go-to actor for characters who need to be sold as condescending dicks. There's no doubt O'Malley is extremely effective in this part, so we hope he takes this as a compliment. Porter, along with Elizabeth Davis, played by Anna Gunn, and a few other investigators are trying to get a sense of what really happened, what all the variables were, and how Sully came to such a drastic decision to land his plan on the river in such a short amount of time. This panel of investigators have been tasked with running flight simulations, digging deeper into Sully and Skiles' past lives outside their time in the cockpit, and what might have been going on outside that fateful day that could have distracted them from focusing on flying. Tom Hanks does a fabulous job portraying this reluctant hero as he deals with what appears to be PTSD stemming from the incident. It should be no great shock Hanks is incredible, but his much more subdued, under-the-radar performance is what truly makes him one of the best in the business. He doesn't need to run an Oscar campaign to get noticed, and he doesn't need to yell from the rooftops that he is a spectacular actor. He just is, and he just acts. Hanks also sells Sully's reaction to the unexpected adulation of random citizens who thank him or hug him or praise him on the street extremely well with a mix of awe and confusion. As the immense stress of having his decision critiqued and played out by simulations mounts on him, Sully realizes he is having his 40+ year career defined by this single moment, and Hanks brings this living, breathing hero to the big screen in a way only Hanks can: by making him both steadfast in his work, but staunch in the knowledge that he did the right thing. Aaron Eckhart is also excellent as Jeff Skiles. Eckhart has had a few slip-ups in his career as of late, but he is really setting the right path back to glory for himself, and it starts with his performance in "Sully." The much more outwardly charismatic of the two pilots, Eckhart as Skiles never questions Sully's decisions, always remaining his co-pilot through and through. We got the sense from his performances Skiles had a deep, undying love and appreciation for Sully, even before this incident occurred. The most intense moments of the film come from flashbacks of the incident, which are interwoven with the rest of the story. These scenes are heart-pounding, even when knowing the ultimate outcome. The CGI implemented in these scenes is simply breathtaking. The plane, its movements, the water landing, everything looks believable. It's crazy knowing this film was made on a $60 million budget and still looks so realistic, whereas everything about "Ben-Hur," the atrocious remake of the epic original with CGI to the gills, cost $100 million to make and looks like it was made for a cool, cheap $20 million. As these flashbacks occur, we learn about our protagonists and their preparations for a long day of flying. Director Clint Eastwood takes his time to build up these characters via flashbacks, especially Sully, to show how meticulous and serious he was with his job as a pilot. Speaking of flashbacks, there are two more in this film which are meant to show a bit of Sully's long, storied career as a pilot, however, these flashbacks grind the film to a screeching halt. At this point, the audience already knows Sully has been a pilot for 40+ years, so to show these flashbacks of his life in the air through the years feels both superfluous and spoon-feeding. There are a host of other performances in "Sully" as well. Laura Linney appears as Sully's wife Lorraine, though she isn't given much of anything to do. Again, these scenes are included in an effort to humanize Sully outside of the cockpit, we feel they are a little unnecessary in the grand scheme of the movie. As we mentioned above, Anna Gunn also plays an investigator alongside Mike O'Malley, and at one point, we thought she was going to be relegated to a background, non-speaking role, but once she starts going, it's hard to deny her commanding essence on screen, even in a more limited role. Behind the scenes, Clint Eastwood plays with light and shadow alongside showcasing Sully's relatable status, showing him steam after a long run, sweat after an intense interview, or smirk after Skiles tells a joke. This is simply a nuanced film all around, and Eastwood's laid back directorial style seems to fit this story perfectly. In the end, "Sully" straddles the line between true life drama and intense, perilous action. It is a fairly solid offering from director Clint Eastwood filled with wonderful lead performances and a fairly engaging story. There are a couple of times when the emotional aspects of the story could have been a skosh more powerful without venturing into maudlin territory, but as a whole, Eastwood accomplishes what he set out to do by bringing this story back into the limelight. Chesley Sullenberger deserves to be hailed as a hero and one we should never forget. We thought this was one of the best movies we have seen in a long time. The actors were incredible, and there was never a boring moment. He is for sure a hero, and what they put him and his copilot through for over a year was a big waste of time and money. It certainly got us out of the early September slump of bad movies! We were definitely never bored watching it. It certainly was a waste of money for those involved, he saved everyone! We understand the need to examine the details since the plane was still lost, but he is a hero first and foremost, it seems like the saving of 155 lives should have negated anything else. Tom Hanks and Clint Eastwood are talented and professional people in the cinema world. I expected a good quality movie and they delivered. Serious movie for people that want to experience deep emotions, educate themselves about the life story and a little bit of the aviation world. Really good movie that can be added to the gold collection of the best American movies of all times. It should receive at least a nomination for the Oscar. They really are hugely talented people! This was definitely a good movie, and we think it's one people will go back and look upon for being entirely true in its cinematic portrayal. 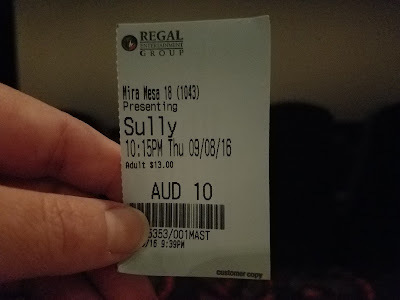 So many films take dramatic license with these true life stories, but it seems "Sully" is almost if not all entirely true, from what we've read. We're glad you enjoyed it!